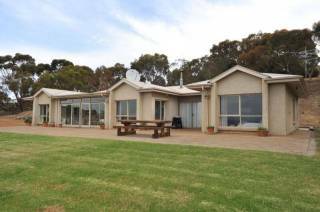 The heritage three bedroom homestead is built from old sandstone from the original settlers to Kangaroo Island bringing the combined charm of beach and bush settings. Each bedroom has its own luxurious ensuite bathroom with double showers and a private courtyard or deck. With views of native bush gardens, rolling hills, and the ocean only 150meters away, you’re sure to start to unwind. Afternoon drinks on your own private deck or a good brandy by the open fire? The choice is yours. Configuration: Sleeps a maximum of six guests: three king-bed rooms (two rooms can be made twin) all with en suite bathrooms. 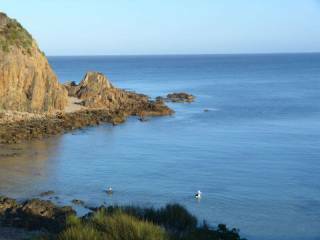 Villa rentals, last minute accommodation, affordable South Australian romantic weekend getaway. Inspired by the iconic Sky House (and set amongst the sheoaks), Sheoaks is a delightful, 2-key, 4 bedroom rammed earth home that cleverly configures to accommodate 2 guests in a self-contained studio-bedroom, or opens up to accommodate larger family groups. 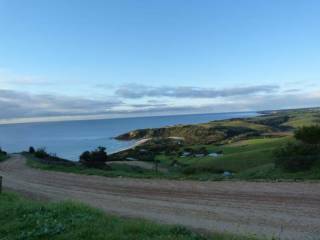 Nestled into the hill overlooking Snellings Beach, Sheoaks is only a three minute walk away with sweeping views to the beach. With a wood-fired heater, elevated round day bed, decks and screened area for insect-free outdoor dining, Sheoaks human scale design and luxury furnishing makes the perfect retreat for both a bush and seaside escape. The sensuous curves of the Cliff House, perched on the cliff overlooking beautiful Snelling’s Beach, inspires complete surrender to relaxation for the perfect romantic get away. The circular tower bedroom has a panoramic window looking out to southern sea, and the cushioned sunken pit with open fire is the ultimate in repose. Luxuriate yourself in your outdoor cliff-edge Jacuzzi, drinking in breathtaking views of Snelling’s Beach, a local pod of Dolphins or the southern stars above. NB: Private helicopter landing area nearby, perfect wedding venue, last minute getaways. Nestled into the surrounding bushland overlooking Snelling's beach, this charming one bedroom retreat is only a 1-minute walk to the beach from. The architect-designed domed roof and round windows include an enclosed sun room and private outdoor lounge area with views across the bay and the headland beyond. The lounge area is 25 meters from the house. There is a private bathroom with a shower. Kangaroo Island, just 16 kilometres off the South Australia's southern coast, is one of Australia's most enchanting natural wilderness destinations. Specializing in hand crafted luxury accommodation, Life Time Private Retreats offers four spectacular holiday houses – The Sky House, The Cliff House, The Settlers Homestead & Sheoaks where you have the option to stay at our in House Only Accommodation or our new all-inclusive House and Dining package. “This is a very special place, run by people who really care…such places are extremely rare (believe me we should know! )” Jill Hartley – luxury travel writer, The Times, London. Children above the age of 10 are charged full rate. A deposit of 10% of the total is required to secure your reservation. The balance is due 30 days prior to your arrival. Please note there is a 2.8% surcharge to ALL card payments. 15 days of arrival date: 100% forfeit of the total booking price. Any cancellation of reservations by the client must be provided in writing to LifeTime Private Retreats, and are subject to payment of the cancellation fees set out below and will be effective only upon written acknowledgement by LifeTime Private Retreats. If a cancellation is received between booking and 30 days before the arrival date, LifeTime Private Retreats will retain 10% of the booking fee. If a cancellation is received 30 days or less prior to the arrival date but at least 15 days before the arrival date, a charge 50% of the booking cost is the cancellation fee. If a cancellation is received less than 15 days prior to the arrival date, a charge 100% of the booking cost is the cancellation fee. No refunds can or will be given in connection with circumstances arising beyond the reasonable control of LifeTime Private Retreats i.e. flight delays by airlines/contracted charter companies/illness or client failure to appear for accommodation. No refund can be given for any unused services or early departures. We strongly urge comprehensive travel insurance to cover clients for cancellations, medical emergencies, additional expenses etc..